One of LeBron James' best passes went to himself Wednesday during Game 3 of the NBA Finals. James performed the high-flying stunt with about 10 minutes remaining in the first quarter of the Cleveland Cavaliers' clash with the Golden State Warriors. He was dribbling against Warriors 7-footer JaVale McGee with a few seconds remaining on the shot clock. The four-time NBA MVP took a few dribbles before putting a shot fake on the Warriors big man. His fake put McGee off balance, enabling him to duck under the large defender. James floated toward the free throw line, before throwing the ball above the square on the backboard. He then ran through the lane and caught the self-pass. James flushed the ball through the net with both hands for a powerful dunk. The shot gave the Cavaliers a 12-4 lead. Cleveland led Golden state 29-28 in the first quarter and 58-52 at halftime. James had 14 points in the first half. Kevin Durant had a game-high 24 points at the break. James leads all players with 40 points and 10.5 rebounds per game in the series. 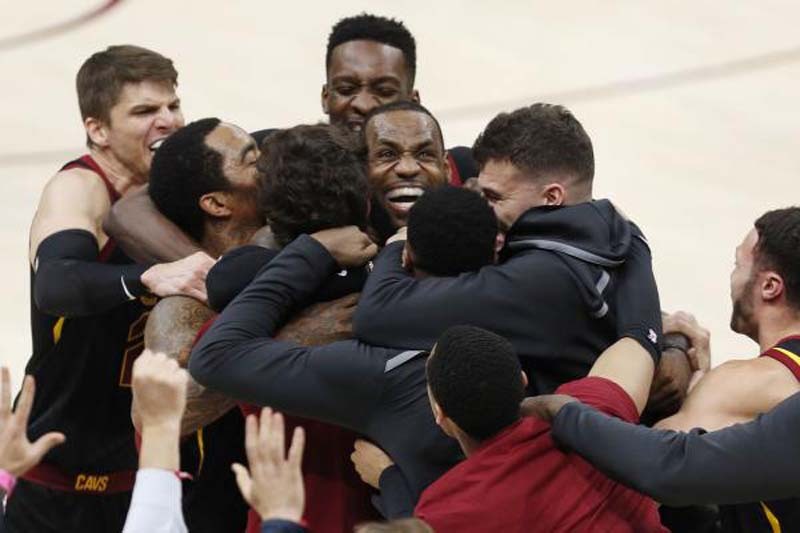 Game 4 of the 2018 NBA Finals is at 9 p.m. Friday in Cleveland. The Warriors held a 2-0 lead in the series entering Wednesday's bout.